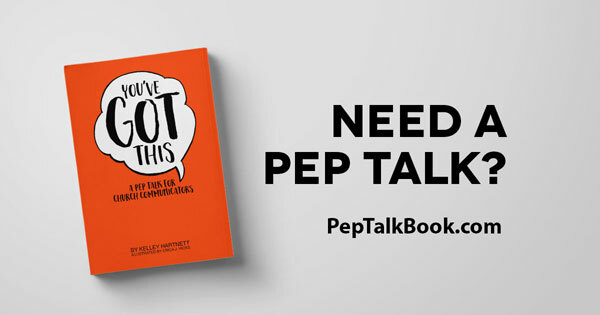 In celebration of our newest book, You’ve Got This: A Pep Talk for Church Communicators by Kelley Hartnett, we’ve been talking about mistakes. Kelley shares one of her mistakes in the book, and rather than being ashamed, our failures are an opportunity to improve. We asked for your best mistake stories, and we got some whoppers. The five best stories won a copy of Kelley’s book, and we’re going to share those winners. Our rector used a specific prayer printed in funeral leaflets and wanted the name of the person listed instead of [name]. For the next funeral I pulled up the file and printed the leaflet. The rector looked it over, gave it back, and said: “Perfect.” So I took him at his word and didn’t look at it again. Yikes. Funerals have to be the worst moment to make a mistake like that. I think we all cry a little bit just hearing that story. It deserves a pep talk. Thanks for sharing. It takes guts to share your mistakes. Proofreading process: Every church should have a proofreading process in place. It should include multiple people (that didn’t catch it in this case, but it’s still a good baseline standard), a checklist of specific things to look for, and time in the schedule to make sure it happens. Checklist: That proofreading checklist should include all the things you need to watch for, from typos and grammar to double-checking basic event info (like names at funerals). It should include confirming the spelling of names, testing links, and style consistency. Highlight what changes: Reusing documents and forms is a great way to be efficient (no need to reinvent the wheel every time), but you absolutely must update the information every time. It might help to highlight the portions that need to change so it’s hard to miss. Lucy Owens already implemented her own system to draw attention to those funeral names so nobody has to shed tears over that mistake again. Remember that we all make mistakes. That can feel horrible in the moment, but we’re only human. Brush yourself off, make amends, and move forward. We all make mistakes. The best of us learn from them. Need more help? Our Courageous Storytellers membership site has a number of resources to stop mistakes, including proofing checklists and how to vet proofreaders.